Back in May 2011 we shared Museum Extension Photos showing the progress being made on the enlarging of our museum building. We're now delighted to announce that on Saturday 15 September 2012 our much larger museum was officially opened by the Honourable Grant Woodhams, MLA for Moore. The Carnamah Museum at 10 Macpherson Street a few hours before the opening! The opening day was held in conjunction with the annual North Midlands Show, which was held at Niven Park in Carnamah. During the afternoon over one hundred people left the showgrounds by bus, car and on foot and made their way down Macpherson Street. Our president George Fowler addressed the gathering before handing the mic over to Grant Woodhams to perform the task of declaring the building open. During his speech Grant remarked that "so much of history resides within us" and congratulated the community on preserving and showcasing its history with such a quality museum. 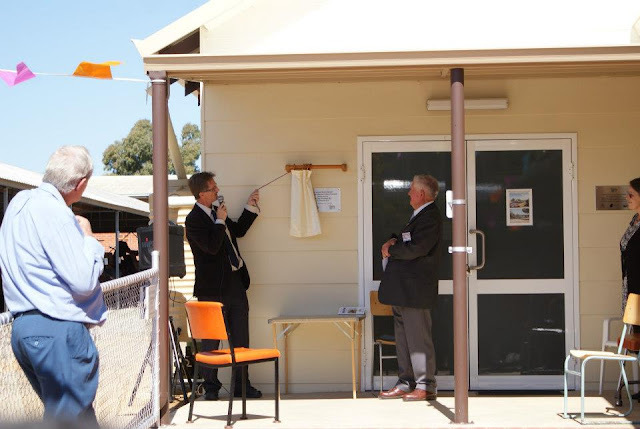 After a few words from Shire of Carnamah president Merle Isbister the time was at hand to open the doors. Those present entered the building while we stood back and admired the fact that our museum could now accommodate a crowd of people! After a solid browsing of the museum everyone returned to the showgrounds for afternoon tea. Patrons viewing our completed Window to the Past project. See our blog post Unveiled: Window to the Past for full details and more photos! It's also appropriate that we thank those who have donated items, photographs and documents over the past twenty years. If you have something that might be suitable for our collection please contact us. We now have the capacity to suitably display or safely store! So what's next? In 2013 the Carnamah townsite will turn 100, we will turn 30, and our website will turn ten! Celebrations may be in order - watch this space! Thanks Bridie, six years in the making! It was a very happy indeed. Thanks Linda! Congratulations Carnamah - such a large space! I look forward to seeing what you've got planned for 2013! got no comment on the museum, sorry. i would love to know how you're getting along. if you used to be bridie hawkridge please contact andy holt. if not let me know, and i can look elsewhere. but how many bridie 's can ther be in carnamah wa. Hi Andy - we've passed on your message and e-mail address to Bridie so hopefully you'll hear from her soon if you haven't already! Thanks Fiona. Big things planned for 2013 - watch this space! congratulations to everyone in your hard work towards making the Carnamah Museum a reality - well done (we were friends with the late Joe Clancy who was part of your community for many years and I'm sure he would have been pleased with the addition of the new Museum.) 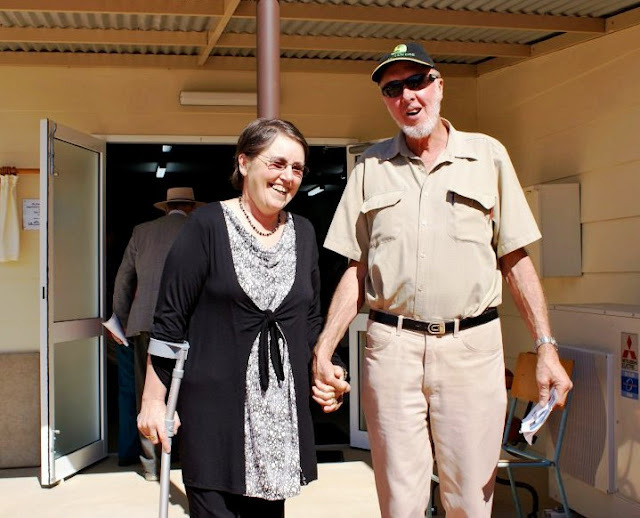 our last visit to Carnamah was before Joe Clancy passed away and he showed us through the museum in the old building which we were then very impressed with kind regards Kaye and Geoffrey Dix Mandurah W.A.